Before we all headed off to our family homes before Christmas, the uni friends and I wanted to celebrate Christmas in traditional fashion; think a roaring log fire, exposed wooden beams and a delicious turkey dinner; and I knew just the place – The Great Fosters. The hotel, in Virginia Water near Windsor was built as a Royal hunting lodge in 1550 and still houses many of the original features, such as the expansive Jacobean fireplaces, moulded ceilings and the mini doorways (made this way to make it easier to keep enemies out during times of battle). Each room is warm and cosy – if only I had my onesie with my I might have been tempted to go for a nap in front of the fireplace! Also in the gardens are sculptures from various artists. 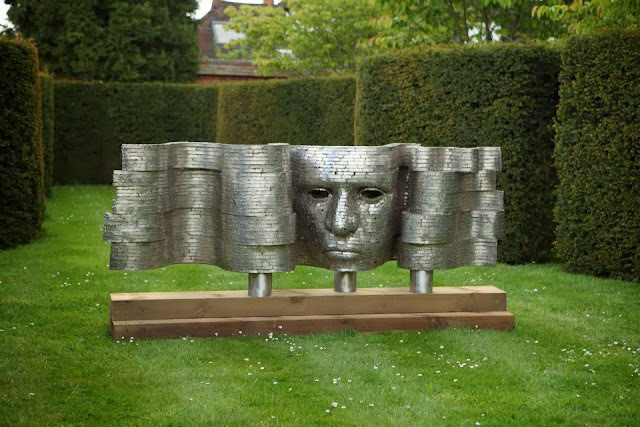 In the summer, the hotel invites artists to exhibit their work in the gardens; above is a piece entitled ‘Standard’ by Rick Kirby, which the hotel has purchased. We were kindly given a tour of the hotel before lunch, which included the cocktail bar and the Tithe Barn below. The girls gave their nod of approval when I told them my dreams of a wedding reception in this room! We dined in The Estate Grill – the hotel’s more contemporary dining room, for simpler, more ingredient – led dining. 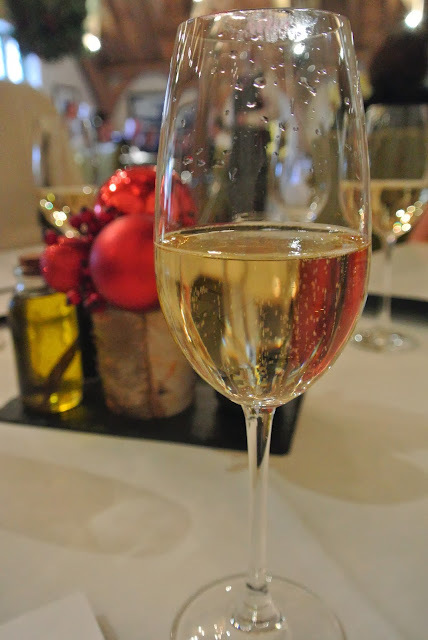 Following a delicious glass of Champagne, we browsed the usual Estate Grill menu which you can see here, as well as the Festive Menu, three course for a very reasonable £27.50. The menu features fresh, seasonal produce, much of which is sourced on the hotel’s land. I chose the traditional Roast Turkey dish – cooked the ‘proper’ way! Rory chose slow cooked beef, while Vicky chose a fabulously presented Salt Baked Beetroot salad. Even the sides were delicious! Many of the vegetables had been picked that very morning from the hotel’s estate. you can’t get much fresher than that! Of course, we all managed to squeeze in some dessert! I chose this mouth watering Cremè Caramel, with ginger milk sorbet, baby bananas and hazelnut. The hotel had been decorated beautifully – a fantastic venue for Christmas and New Year celebrations! Nearby is the historic and scenic town of Windsor, the pebbled streets and Christmas market make it a wonderful festive afternoon out. 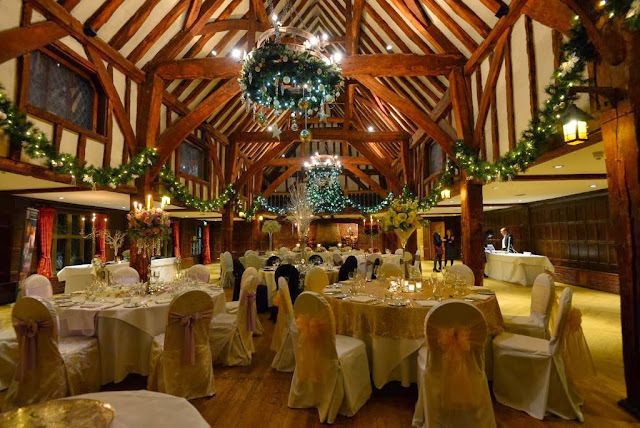 The hotel and town are easily accessible from London via train from Waterloo to Egham, which takes just over thirty minutes – so you can have all the opulence and fresh air of the countryside without having to travel too far home. 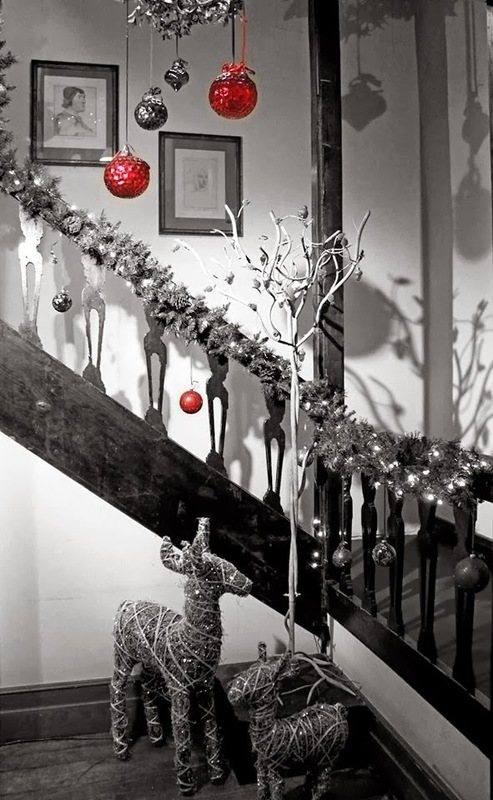 So, readers, if you are looking to escape to the country for Christmas, New Year, or even if you’re looking for a wedding venue; The Great Fosters comes highly recommended! Take a look at their website here.